The test-knit mittens are finished. Aren’t they lovely? These were great fun for me, and the testers were happy, too. I let them choose their own colorways, so hopefully they’ll enjoy their mittens for a long time to come. Bright rainbow-y mittens knit by Cheryl of yarnbee. Blue and purple mittens knit by Nichole. See Cheryl’s mittens on Ravelry. See Nichole’s mittens on Ravelry. Read about it all on in the Fiddlehead blog category and my Ravelry page. This pattern’s done. Supercute packaging is getting there. The yarn’s what’s left to do! A kit to make these mittens will be available in the shop at the next update, on 2/12/08. From the reception these got over at Flickr today, I’m thinking I’d better spend the next two weeks doing not much more than dyeing yarn massive amounts of yarn. Would there be great objection to a mitten kit only update (with stuff from Sarah, too, of course)? My plan is to dye different colorways for each shop update so that if you don’t see anything that grabs you on a given day, there might be something that sings to you on another. Three sizes can be knit, with only the gauge changing. There will be enough yarn to knit any of the three sizes. Yeah, I know. I want that, too. I need to find a suitable commercial substitute to test in and then we’ll see. Does anyone have experience with Dale of Norway Tuir? I want a very sturdy and readily available yarn for a sub. It seems that Tuir is discontinued. Testers and yarns have been found. Thanks, all! This month’s fiber is ready to go. Shipping will begin tomorrow. I’m cutting it close to be calling it January’s fiber, huh? I’ll do better next month. Promise. As long as there isn’t a big rush for renewals overnight, I should be putting up a goodly amount of fiber club slots for new members. They go up for sale at 10 am EST. (If you’re not a current member, do not buy before then or I’ll cancel the order. I’m sorry!) See you then! Those are breathtaking! I may just have to purchase the kit when it goes on sale! They look so awesome! If I can scrounge up the cash (and manage to be not in class or something when you post the update) I will *so* be buying a kit! Um, yeah, if you dye like a madwoman, just know that I will be practicing key strokes to insure I can actually get a set…. Beautiful, beautiful mittens. It’s going to be a frenzy. I love those so much! And the different colors are amazing. I need to have the kit. Need. Gorgeous. Yes, okay, mittens only. I’ve never knit mittens, but these are too beautiful to pass up. I’m kind of speechless – this are gorgeous – I must learn this technique! These are truly beautiful Adrian. Really works of art. Congrats! I’m still drooling!! I was thinking, Ultra Alpaca Lite might work up very nice. I just finished a sweater in the Ultra alpaca, and it does halo, it knits beautifully on a 6-7 so the lite will probably be great on a 2 or a 3. I’m happy to volunteer to knit them in a commercial yarn!! I think that an all-mitten-kit update would be tops! I’ve been excited to get a kit and knit them up since Nichole mentioned that she was test knitting them. And then when I saw them… and on and on. Very, very nice. Nice colors and nice work. Oh, my, those are pretty!! I’ll definitely have to check out your shop, when you have them available! My mother knits just about all her colourwork sweaters out of Tiur or Heilo. If you want, I can ask her if she thinks it’d work for mittens too. Ooh, yay, glad to see that you’re looking to offer a pattern-only version, too! It may be going out of production, and may not be sturdy. I’ve never used it, myself, though. I think Mags may be on to something with Heilo. I’ve never used it, but have fondled it at the LYS, and it certainly does seem like a classic, tough Norweigan yarn, and comes in tons of colors. And I think there’s a Knitpicks yarn that is very similar to Heilo, for folks looking to save a few bucks. I like Heilo better than Tiur. There’s also Peer Gynt, which wears like iron but only comes in a small number of colors. Louet Gems Opal comes in lots of colors and I’ve found that it wears well. Ravelry seems to indicate that it’s been discontinued but I hadn’t heard that and the same information isn’t on Yarndex. Those mittens are really amazing, and I want to make them, too! I’m so glad you’re putting this whole thing together. Just beautiful! Someday I want to be able to knit mittens like that. Sigh. A mitten shop update would be the ultimate February shop update. Tea,chocolate, a roaring fire in the fireplace, snowing outside, beautiful yarn and in the end… mittens. Perfect. Those mittens are beautiful! I wouldn’t object to a mitten-only update. It’s going on my calendar. what a lovely mittens, love the colors. I am in love with the rainbow pair. I’m kind of thinking that maybe the lining will be enough that I can actually wear them, despite the mohair. They’d take longer to knit, but they are so worth it! Love the mittens, especially the monochromatic scheme of the blue and purple ones. It’s so 8 bit, I love it. Tiur is fabulous but it is discontinued. :( We’ve been looking for a substitute for our shop and haven’t found one yet. Tiur: I knit a plain, greyish mistake rib scarf from it once. It turned out to be a bit too itchy for my neck. C wears it, though, and it’s fine for him, although it’s gotten a little matted and pilled in the center area that spends more time wrapped around his neck. Pretty colors, but I’m not sure I’d recommend it. Your mittens are fantastic! The colors are so amazing and I totally need to make one! Beautiful mittens! I’m excited that you’ll be offering them soon … but … any non-mohair options for the kits? Pretty please? 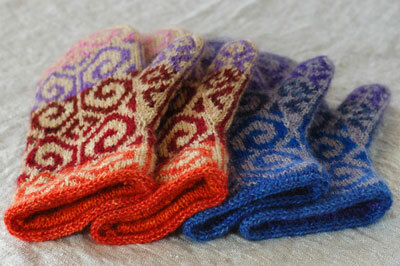 I was thinking the new Noro sock would be lovely for these, but maybe it’s too thin/not sturdy enough. Seems a shame to sub a different yarn, but there are some nice commercial options. Tiur would be a little itchy, but aren’t these lined? Since Tiur is being discontinued, I would go with Berroco Ultra Alpaca Light or Gems Merino Sport. I will buy the full kit, make an extra for me! :-> Just the pattern is fine, but the beauty of this is your yarn included! Wow, fiber club went fast. I came to the site at 10:45 yesterday and you had already sold out. Next renewal I’m treating it like people did with the iPhone and I’ll camp out a week early. I noticed these beauties when I saw lots of people queuing them in Ravelry. I think these are going to catch like wildfire – the combination of color and pattern is the right mix of traditional and modern. I used Tiur for a pair of colorwork stockings. I would need to pull them out again to know for sure, but I remember them feeling very sturdy, thick and warm. The yarn isn’t too hairy, given the nylon content, and it doesn’t pill. I’d be willing to send you some of my yarn or do some test knitting with it, if you’re interested. Sorry, I said nylon but meant mohair! You have been given a “You Make My Day Award”, because you completely do! Thank you! I’m sure you make ALOT of people’s day, and you do make mine so there! great news! looking forward to the kits!!! they all look fab. Looking forward to it. And by the way, I’ve named you one of my Make My Day Blogs. I bet you’ve a;ready been tagged, but just thought you’d like top know you blow my skirt up, Adrian. I was just coming on to let you know that you make my day, and I see I’m not the only one! Keep us posted. I am definitely interested! hello, I just found your blog and I must say your work is beautiful! These mittens are amazing! The mittens that you knit your Mom are incredibly beautiful! So are the mittens that Cheryl and Nichole knit. I love all the different color combos. Are you going to be offering the kits with different fibers? I’m wondering because I’m allergic to Alpaca (all the good stuff : ( And am hoping that the kits will be with wool. I’m so upset I didn’t get my mitten kit… better luck next time.